Stop worrying about the success of your company and start living in it. In today’s society, starting and maintaining a business is an extremely difficult task. We are certain that God has called us to fulfill a particular need, but fear, obstacles, lack of resources, and a failing economy threaten our businesses’ survival. 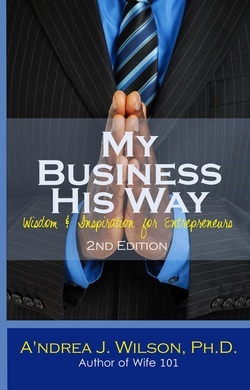 My Business, His Way reminds us that faith is the key to outlasting hardship. These timely devotions challenge us to center our businesses on biblical teachings and allow the Lord to develop us into the leaders we were destined to be. No matter the phase of entrepreneurship, My Business, His Way empowers business owners to trust God and expect miracles every day.